Back in July, I did a spotlight post on The Hunger Games (before it started getting tons of attention), and, to date, that post is still the Top Viewed post on my site. Once the post started getting a bunch of attention, I knew that The Hunger Games was going to be a big deal. “A Big Deal” is an understatement. Well, I can’t answer that question for you. haha. I decided to not read the book until AFTER watching the movie. This decision was made mainly because I wanted to enjoy the movie for the first time as simply that…a movie (without trying to critique its interpretation of what was penned in the book). And I am glad I did so. No expectations to be met. But may I say, that many of my friends who had high expectations from reading the book prior also saw this as a fantastic adaptation. That being said, here is my “non-comparison” review! The Hunger Games begins with a very telling introduction into the world of the protagonist, Katniss Everdeen of District 12 of Panem. Immediately engrossing you into the film, there is hardly a moment that your attention will be drawn away. 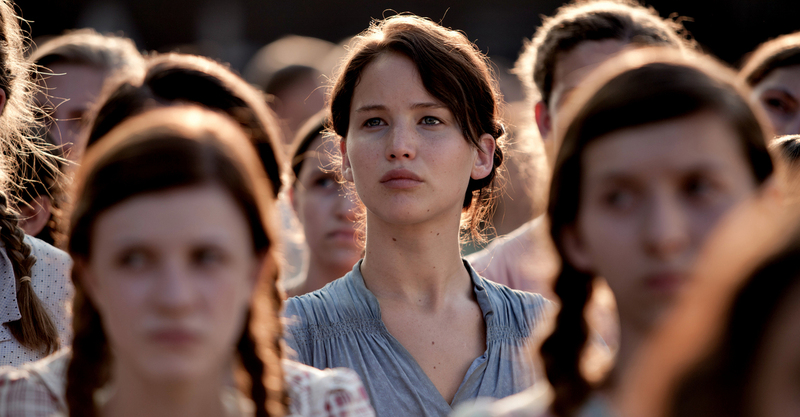 The Hunger Games truly keeps you hungry for each upcoming scene as the story unfolds. There are several amazing elements that comprise this amazing film- Contributing contrasts; Fantastic cast/characters; High level mixture of action, drama, and suspense; and an impressive soundtrack. Here’s a quick look at just a few of these elements and how they worked to make this film a success. But the true strength that makes The Hunger Games a winner is the look/feel, the cast/characters, and the storytelling (riddled with foreboding events leading to the following films). It is interesting to see the way in which the film paints the stark differences between the two worlds that Katniss embarks through. The cold and impoverished district she calls home versus the colorful, grandiose, and exciting Capitol of Panem is a telling contrast not too easily forgotten. It all adds to the believability of the environment, the events, and the characters. Speaking of the characters, Wow! What characters! When doing my initial research on the film project, I learned a little bit of what to expect, but it was nowhere near how amazingly well done these characters are shown in the film. 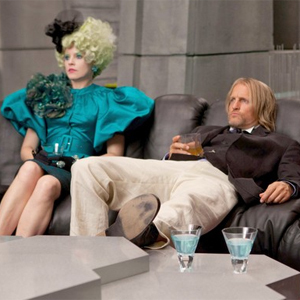 From Stanley Tucci and Elizabeth Banks as some of the best scene-stealers in cinematic history in their respective roles; to a rather subdued Woody Harrelson and Donald Sutherland; to Jennifer Lawrence’s flawless performance as Katniss Everdeen; it is the characters and their respective journeys that add an additional sense of awe and wonder to The Hunger Games. 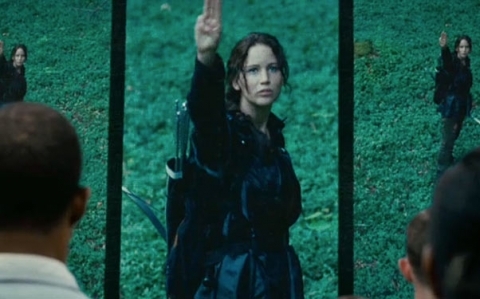 Lawrence could not have done anything better to make Katniss a character worthy of our attention and emotion. For someone who got into acting without taking a single drama class for instruction in acting, Lawrence definitely proves she has what it takes to be believable in carrying the lead role for such an epic series. Her emotional performance will make you do nothing but cheer and feel for her plight! Cannot wait to see the follow-up films! So many members of the rest of the cast sold their parts so well, no matter how small, that emotions will undoubtedly rise when events take place. 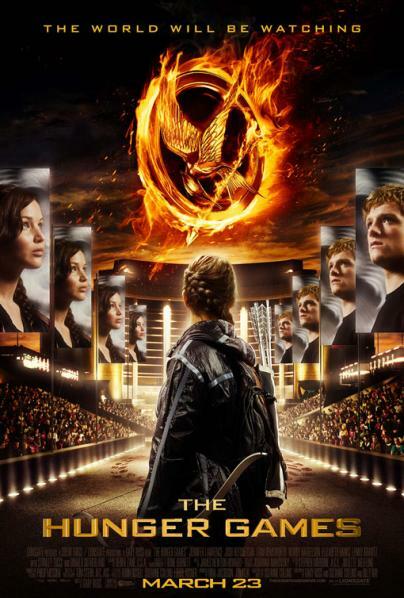 Tears, sadness, anger, laughter, excitement, joy, awe, action, and wonder…all good words used to describe the experience you will have when watching The Hunger Games. The story itself, while under scrutiny for plagiarism (look up the book/film Battle Royale), is one full of familiarity tied with originality. Love, war, power, corruption, self-discovery and acceptance, and more, there is something for every viewer to relate to when watching this film. It leaves you with a well-enough feeling of closure with enough openings leaving you with plenty to look forward to in the coming sequels. I would personally give it a 3ish. There was little to no development in the film. They didn’t develop hardly any of the characters, romances, manipulations, friendships, etc. The only reason I slightly cared about any of the characters is because I had already bonded to them in the book. I mean seriously, you’re going to give Rue a total of 5 minutes of screen time in a 2.5 hour long movie? How am I supposed to bond to that? And she is just one of the several examples. The people themselves looked anything but hungry/starving/savage. I mean, did you see Gale’s hair? That’s way beyond some Master Cuts haircut. Overall, I felt the movie was entertaining, but it was nothing more than that. If I wanted to see a hallow-entertaining-survival-action movie I’d just watch “Surviving The Game” with Ice-T. But even then that film has better character development than “The Hunger Games”. I honestly feel a simple voice over would have helped with a lot of the film’s issues, but for all I know the studio or someone was against it. Overall, my biggest issue is that by the end of the film I could have cared less who lived or died. that’s pretty sad that you could have cared less about them. thanks for sharing your perspective. You already know I disagree with you, but it was interesting to hear your thoughts. I felt that, yes, they could’ve shown more of Rue, but that didn’t keep me from liking her character and bonding, as you say, to her and her presence. The movie would’ve been far much longer if they did everything you suggest. I thought the snapshot of different characters was adequate. Quite appropriate I might add. But I can see where you might tend to feel as such. I am surprised to hear that you felt very little for the characters. Even with the book being written from Katniss’ point of view and the movie similarly following suit for the most part. As for the people, they did a good job showing the depravity and sadness of District 12. but, that’s just my perspective. Thanks for sharing yours! Obviously we have to agree to disagree. I wish I could say I was just being soulless. Unfortunately, I’m the same cat that cries at just about every movie I see (Hey, I LOVE good stories OK! lol). Sadly, It’s not me that’s soulless, it’s the characters. They had absolutely no depth. 2 minute’s per character was not enough for me to care about them. Even Katniss felt very hallow. That’s the main issue that could have been solved via voice-over while she’s… you know… sitting in a tree. That would have both helped development and added nothing to the time. All that said, I actually was surprised by Lenny Kravits’ performance. He can act better than a lot of people anticipated. Also, I liked Elisabeth Bank’s and Woody Harrelson. Now that I think about it, they did more development for the sideline characters than they did with any of the tributes lol. haha. yep. agree to disagree! LOL. your comment “Hey, I LOVE good stories OK! lol” made me laugh. a voice over is definitely an idea that might’ve worked if done correctly. I really think so. And honestly, I actually am not discouraged for the sequel. I think considering how the book is written it was a great effort. I just hope they can address some of the concerns that I had for the next film. Till next time! My wife and I really feel that this movie was made for people who have read the book and know some of the backstory. So if you are planning to go see it, take someone with you or read the book prior to going. However, having said this we agree with the rating TFF gave the movie. Cheers! Yes, it was a longer movie (hooray for getting our money’s worth) and developing each character would have made it waaaay too long. Perhaps there is a greater sense of future planning for the sequels in this category than we thought! There are 2 more movies wherewith they can develop even more of the characters. I don’t know that I could say this film was made for people “who have read the book and know some of the backstory” though. Granted, I knew the backstory before seeing it, but I keep seeing several responses online from people that haven’t read the book or know any backstory that really enjoyed it. No doubt, it is even highly more enjoyed by those who do know the backstory though. On that I will agree. I’ve read the first two books as well, but perhaps they did as much as they could with this for a movie. Rue was woefully underused and I remember crying while reading the book where here I was just a little upset. The film does a fine job of capturing the most memorable parts of the book. What scarred me more than anything in the movie was seeing the six year olds in the audience. I’m not even a parent and I would never let a child that young see this movie. Rue was underused, but I’ll tell you, I almost cried during the film. Like you, I feel “they did as much as they could with this for a movie.” Looking forward to finishing the book. Yeah, I’m with you on the younger audiences there. Seeing it this afternoon. Great to hear more positivity. Enjoy reading the book! Enjoy the film. I am beginning the book today. Not much else to do when at home sick. ha. I decided I will see it. Not sure when tho coz I am still in the phase of being obsessed with Japanese TVSeries. ha. I still look forward to your thoughts nonetheless! Great review – sounds like you really really enjoyed it! Sadly, I can’t say the same for myself. I thought it was enjoyable enough, but I wasn’t drawn into the world as much as you were. The characters were fine, though nothing about any of them really stood out. There wasn’t enough of an emphasis on the whys and the real cruelty of watching teenagers kill themselves just for fun and for a way of their government to keep control of the people. I haven’t read the books and glad I went into the film without reading them. So I could just judge the film on the merits of the film. I feel like I’m missing something. Almost everyone else in the world seems to have really, really enjoyed it! Thank you Jaina. Yes, I did enjoy it very much. While several are mentioning a lack of development of characters and the whys and hows, I still found it to be sufficient for the experience and story I was hoping for. Like you, I am glad I watched it without reading the book for the same reason. But now, I look forward to reading the books. Thanks for poppin in. I will be sure to read your review here shortly. Good review, T! I envy your conciseness. I do want to see this but it didn’t happen this weekend, I’m hoping it will be possible next weekend. 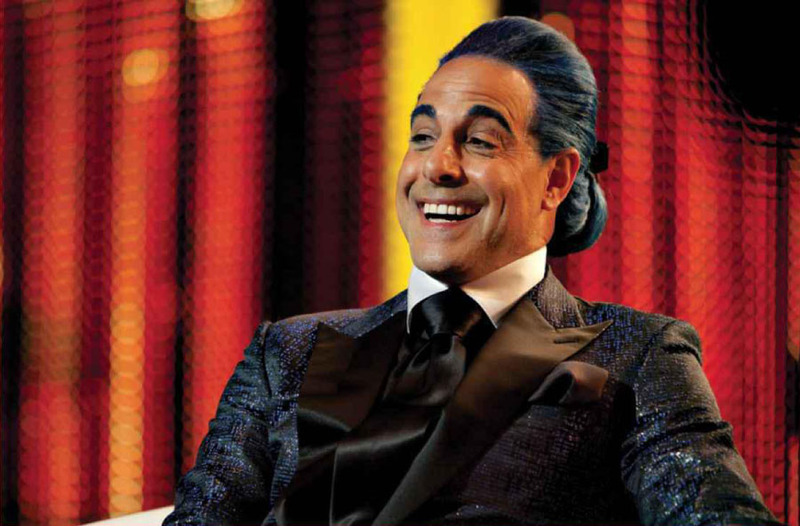 I had forgotten Stanley Tucci was in it, he is a known scene-stealer & one of my favorite actors. Paula, thank you. you are very kind. I can’t wait to hear your thoughts on The Hunger Games. I have a feeling you will really appreciate it. I’m making my rounds reading the reviews for “The Hunger Games” that everyone seems to have devoted some time to this weekend. My plan is to let the craze die down and go watch it. Niels! Happy Sunday. I def understand avoiding the crowds. I look forward to your thoughts on the film when you see it. I think I’d rather read the books before I see this film. I’d like to see how the film likened to the book series. You seem to have enjoyed it enormously! After the last few movies you have seen recently, this sounds like a huge relief for you to see! Well, I def can’t wait to see your thoughts. I am starting the book. Perhaps we can read through the series together…although you will prob beat me to the end. and, you’re right. man, the quality of movies as of late…I was so relieved to watch a good one! Woo hoo! I refrain from reading your review until I’m done w/ mine and I’m glad we agree w/ our rating. I definitely look forward to the sequels! 🙂 Cannot wait to see your thoughts. So glad you got to check out the film this weekend. You braved the masses huh? Great review, I really enjoyed the film and am now reading the books! thanks so much. Man, I’m glad you liked it too. I just started the book myself! So, you didn’t read the book either before watching the movie? Ooh, you got to see The Raid? It was only in about 14 screens this past weekend…Lucky!! I want to see it quite a bit! I will have to meander over to your page and read your thoughts. I’m behind on your reviews. Glad you liked The Hunger Games. Ill wait for you to read my review and see what I thought about Raid. Won’t post my opinion here…lol. Is it going to be in your area anytime soon. Last wknd was a limited relased. They have to release it in more theatres because it sold out where I was at. 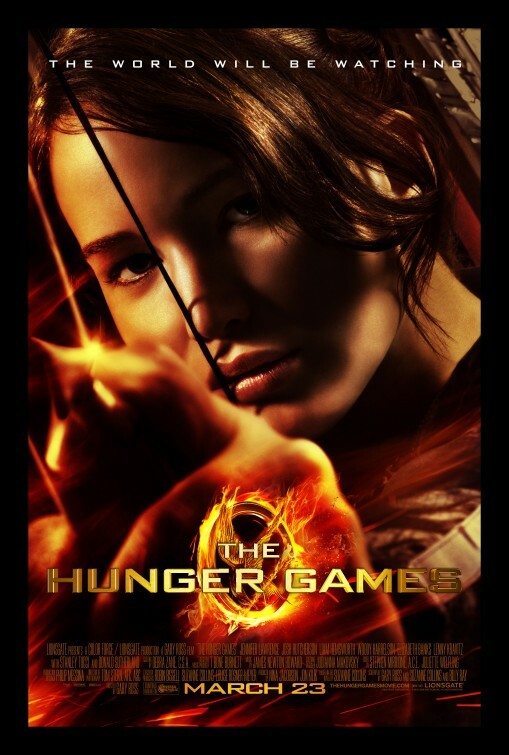 Yes enjoyed Hunger Games…now Im reading the book, and only read the 1st chapter and Im hooked. So far the movie adaption is on point, and Jennifer Lawrence totally embodies her character in the book. I cannot wait to check out the action. You’re right about the book so far! Lovin it. I thought you wrote a really balanced review and inspired a lot of comments. I went into ‘The Hunger Games’ without knowing of the book series or seeing a trailer, I went because the basic outline interested me. So I didn’t really have a lot of preconceived ideas about the characters or stories, and as such, I really enjoyed the film. I thought that Jennifer Lawrence was wonderful in her role, really strong and independent, and out-acted Josh Hutcherson off the screen. I loved the supporting “adult” cast of Stanley Tucci, Woody Harrelson, and Elizabeth Banks. My major gripe was with the handy-cam feel and action scenes being filmed too close so that it made it hard to focus, however I enjoyed the film, and do look forward to the sequels. I am now reading the book and have an even greater appreciation for the movie. Your gripe with the film was mine as well, and, I’ll tell ya, I don’t really understand why so many people are seeming to love Josh Hutcherson. He really wasn’t all that great to me. I really enjoyed it. I haven’t read the books, I always enjoy a book-based film more if I haven’t read it. I saw the first two Dragon Tattoo films, really enjoyed them; then I read the books and didn’t enjoy the final film so much. I think I came out of the film having wanted more closure on some of the story-lines, but this was before I realised that it would be a trilogy, so I’m looking forward to more to come. Russell! Thank you for stopping in and commenting. Sorry I missed your comment earlier. I am glad that you liked the movie too. It’s a sign of a good movie sometimes when it leaves you wanting more and looking forward to the continuations.